Do you like the look of a bow tie? 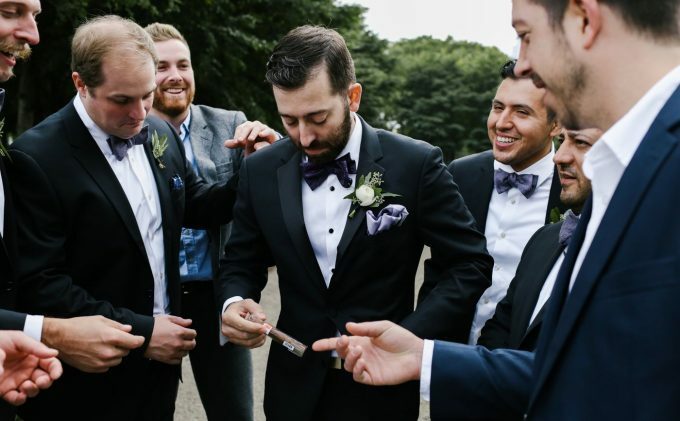 Are your groomsmen wearing bow ties but no one know how to tie one? You’ve come to the right place! We’ve teamed up with experts on the topic, The Groomsman Suit, to show you how to tie a bow tie for your wedding. With photo and video instruction, you’ll know the perfect technique after reading this informative post. Take it away, Diana! Did you know that before buttons were invented, men would use a sharp pin to keep the top of their shirts closed? The pin transitioned to a scarf during the 17th century Thirty Year War and centuries later, in France, it evolved into the bow tie we know and love today. Back then, men who wore bow ties were considered worldly and highly intellectual. We think that’s due to of the technical acumen required to tie the darn thing! Thanks to the invention of the pre-tied bow tie, wearing a bow tie has become a part of everyday fashion. While pre-tie bow ties can be handy and ensure a certain level of consistency when groups are wearing them (i.e. groomsmen and bridesmen), there really is nothing like a hand tied bow tie. 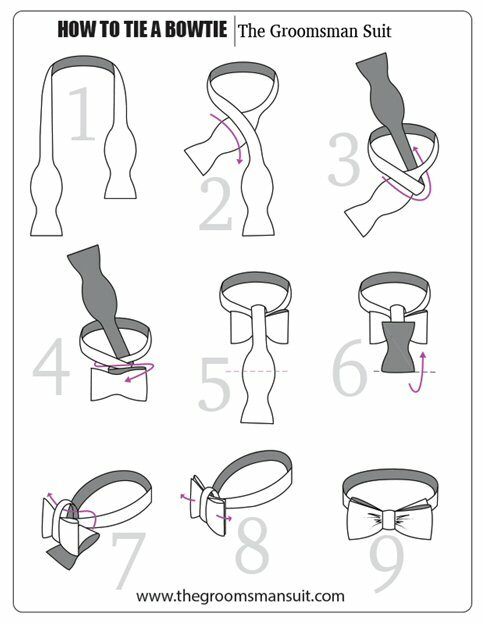 As part of The Groomsman Suit’s commitment to helping guys look and feel their best, we created this step by step guide to tying your own bow tie. With a little practice, you will be an expert! Once you’ve mastered the art of tying a bow tie, you can explore different shapes. Tied similarly to the butterfly, the straight edge bow tie will help you stand out in a more casual setting. We like to reserve the slightly more complicated diamond point bow tie for more formal occasions. When tying this knot, you must make sure you align the pointed ends perfectly. There will always be one side with an end at the front and a side with the end behind the bow. The pointed end behind the bow has to be positioned to peek out beyond the bow fold to show its shape. This will ensure that both sides of the bow tie have a pointed shape. 1. Find the right size – In the video above, a standard 2” butterfly bow tie was used. 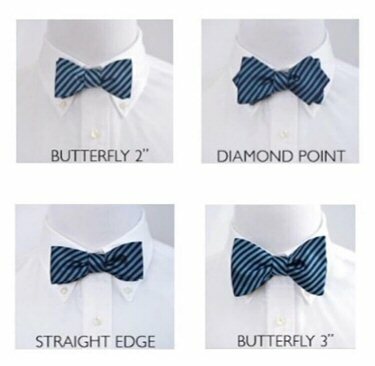 A 2-2.5” butterfly bow tie is the most versatile and will work in most any occasion. Unless you have a very large neck size, we don’t recommend using a big butterfly (i.e. 3” size). The ends of your bow tie should align with the outermost crests of your temples. 2. 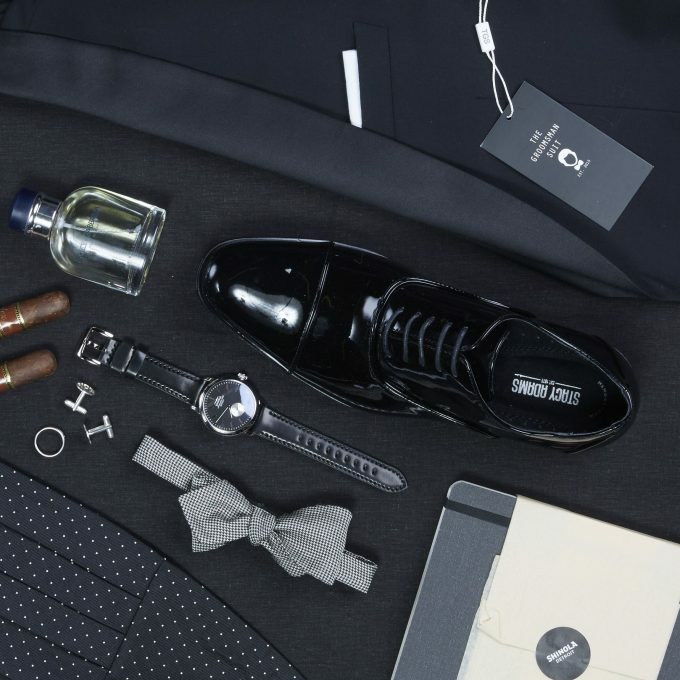 Pick the right fabric – Shinier fabrics like silk and satin are appropriate for more formal occasions. If you’re putting on a bow tie before you head out for a fun night at the bar, a cotton, linen or wool fabrics are the right choice. TIP: You can request a swatch here! 3. Wear the right dress shirt – You can never go wrong with a crisp white dress shirt and that is really the only option for a formal silk or satin bow tie. 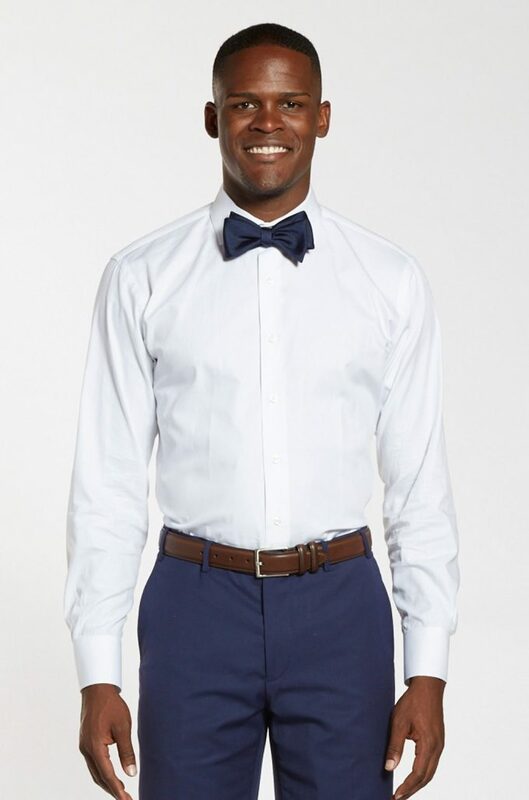 For a more casual look, pair your cotton, linen or wool bow tie with gray or lightly colored/patterned dress shirt. Nothing says let’s party like a bow tie! They are a fun and unique way to style the guys in your wedding. A hand tied bow tie will always look better than a pre-tied one so take a few minutes before the big day to master it. If you are a groomsman or bridesman, consider learning part of your wedding duties! If you have any questions about how to tie a bow tie, add them to the comments below! This is a sponsored post in collaboration with The Groomsman Suit. Should You Rent or Buy a Tuxedo? Giveaway: Win Groomsmen Bottle Openers!